Fabric Manufacturing Fabric Type What Types of Cotton Fabric Produced in Textile Industry? What Types of Cotton Fabric Produced in Textile Industry? The fabric can be broadly classified in the below manner. The cotton fabric can be divided into grey cotton fabric, bleached cotton fabric and colored or dyed cotton fabric. Among these, the bleached cotton fabric and colored cotton fabric are also grouped together and called as processed cotton fabric. This is cotton fabric in the spun state, woven with the plain cotton yarn. The fabric is not put through the scouting and bleaching process etc. it has pale yellowish brown color and it has small crushed shells of the seed cotton sticking to it. Therefore, it is not used for goods of higher quality. It should be noted here that, the plain fabric (Ground) in case of white material and dress material means the material or cloth but the “ground” in Grey cotton fabric means unprocessed fabric. The grey cotton fabric is boiled in liquid after adding soap; soda etc. to it and it is washed properly. Thus, the dirt adhered during the spinning and weaving processes etc. and the warp paste (size) etc. is removed. Then the fabric is bleached with bleaching powder or hydrogen peroxide. This fabric, with a while finishing is the bleached fabric. This is general name for dyed cotton. It can be divided in detail as Yarn Dyed Cotton fabric, Piece Dyed cotton fabric and printed cotton fabric. The yarn dyed cotton fabric is woven after using the cotton yarn dyed for a part or whole of the warp and weft. The figured cotton fabric has more or less exceptions but most of it is yarn dyed. The piece dyed cotton fabric is dyed with one color after the fabric is ready. Therefore, it is also called as plain dyed cotton fabric (or plain cotton fabric). Printed cotton fabric is the common name for the fabric, which has designed colored in shapes. 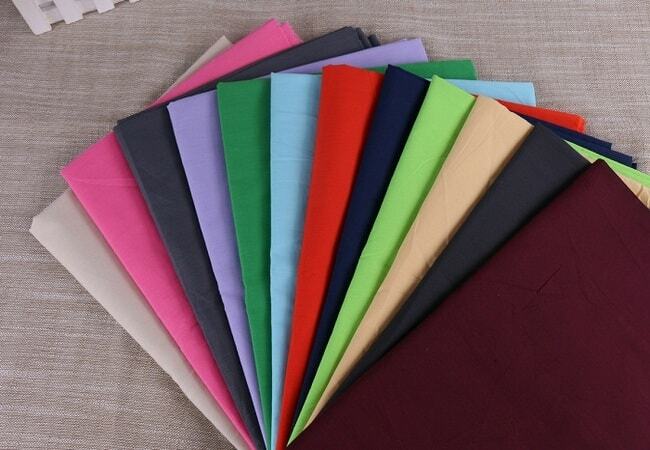 The plain dyed cotton fabric is also called as plain cloth. Whereas, the figured cotton fabric and printed cotton fabric are concisely called as pattern cloth. Further, all these fabrics, whether yarn-dyed, piece-dyed or printed fabric, are usually bleached before dyeing so that they will show dyed colors. The cotton fabric is sometimes classified according to its width, as wide cotton fabric and narrow cotton fabric. If the wide fabric is divided further, there are two kinds, such as, double width and triple width. The cotton fabric for Japanese style dresses as 36cm as standard width. The fabrics with this width are termed as fabrics of narrow width. Not only the cotton fabrics, but all the fabrics have their special characteristics, such as material thickness, width, pattern, color combination, stripes and design, depending on the purpose for which it is to be used. The above ones are comprehensive classifications. But, the cotton fabric varies a lot in appearance and texture according to the yarn count of the warp and weft, which make up the fabric. The difference is also seen due to the change in density and pattern etc. Therefore, the unique commodity name of each one is given according to its constitution. However, these names are just concepts and even in the fabrics with the same name, there is a relatively wide range of yarn count and density. So, the external appearance looks quite different.